A reallocation of the used trolleybuses from already closed trolleybus operations on the still active trolleybus operations was also here again the replacement for missing new vehicles. 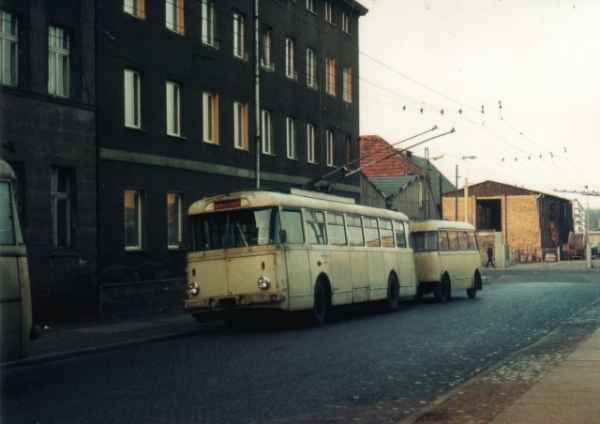 In September 1977 Eberswalde received three Gera trolleybuses of the Czech type ŠKODA 9 Tr because there at the 14/09/1977 the trolleybus operation was stopped. The Gera trolleybus no. 325 of the Czech type ŠKODA 9Tr14 received the still open car no.31I. The Gera trolleybus no. 324 replaced that in the meantime scrap ripe trolleybus no. 29I and received the car no. 29II . The Gera trolleybus no. 327 received a special task. It was intended as "Wechselwagen" ("change car"), i.e. 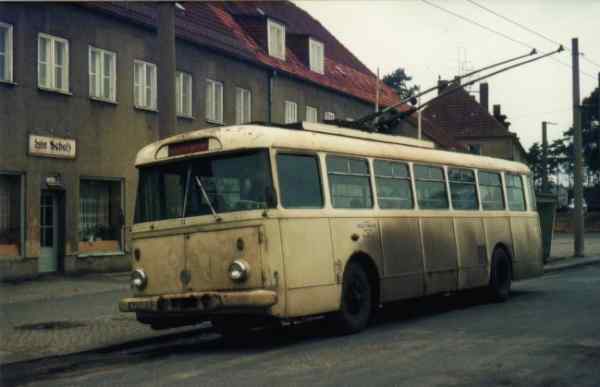 it drove with the registrations, licence numbers and car numbers of other trolleybuses, which received a large repair in the Eberswalde workshop, in the regular passenger service. 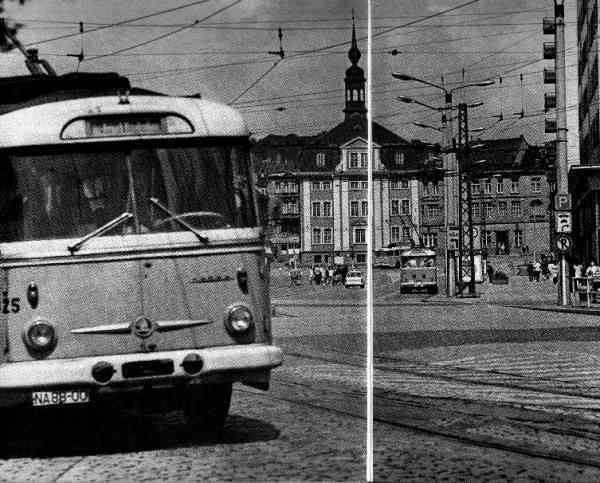 The "Wechselwagen" ("change car") was so inter alia for the trolleybuses with the car numbers 16, 22, 24, 25 and 29 in the use. Because a public transportation could have only an authorized number of vehicles, this procedure was necessary for concealment of surplus vehicles. Surplus vehicles would have been transferred otherwise to other public transportation. Starting from March 1984 the Gera trolleybus no. 327 was used as trolleybus no. 29III and the trolleybus no. 29II was scrapped. The photo shows the Gera trolleybus no. 325 and later Eberswalde trolleybus no. 31I of The Czech type ŠKODA 9 Tr14 in Gera. The photo shows the former Gera trolleybus no. 325 and later Eberswalde trolleybus no. 31I of the Czech type ŠKODA 9Tr14 at the final stop Nordend. The photo shows the former Gera trolleybus no. 334 and later Eberswalde trolleybus no. 29II of the Czech type ŠKODA 9 Tr12 briefly after the drive from the depot Eberswalde/Bergerstraße in the Zimmerstraße in direction to Karl-Marx-Platz.